Ibiza Clubbing Guide » Wave off the season @HeartIbiza the most avant-garde club on the island residency to some of the most respected eclectic artists in the electronic music scene! 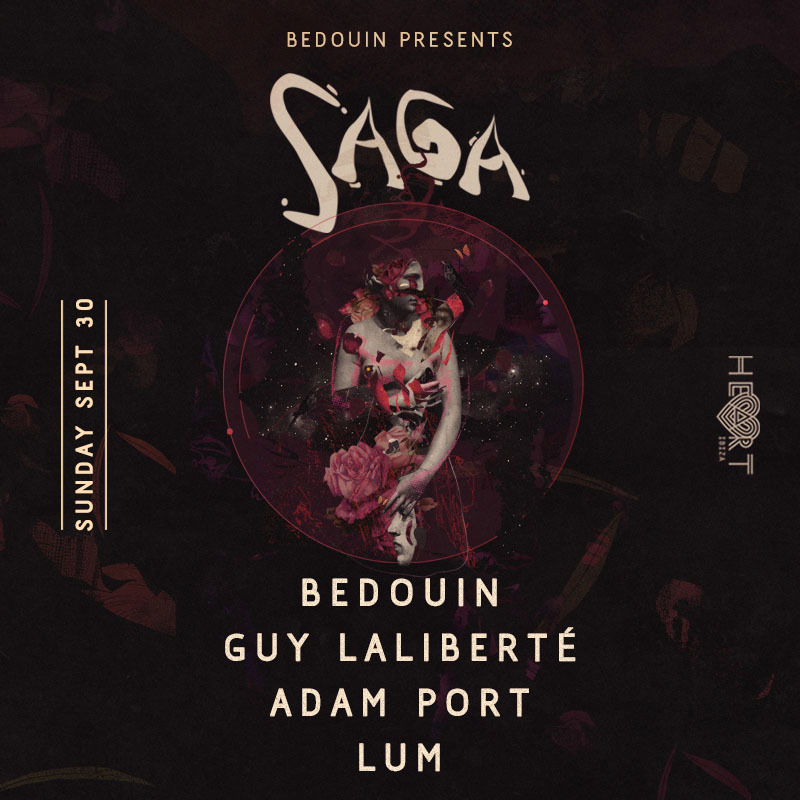 Sep 30th, we journey through the final chapter of Saga with Bedouin, Guy Laliberte, Adam Port & LUM! 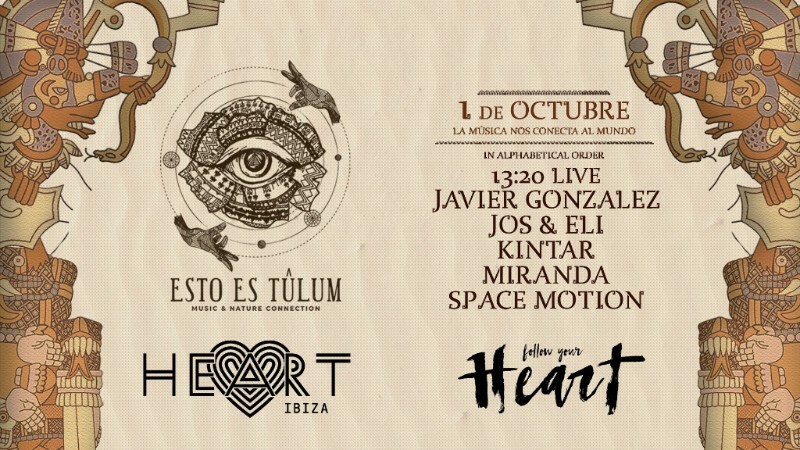 ESTO ES TULUM comes to Ibiza for the first time at HEART IBIZA. ESTO ES TULUM is a new project that comes to Ibiza from the Mayan lands, with the common desire to make the world conscious of returning to Earth’s energy, connecting people through music and nature. Esto Es Tulum’s sound will go from deep house, afro house, to organic and ethnic instruments, by well-known artists and producers in the international electronic music scene. ESTO ES TULUM will host a bunch of festivals that will be held in Tulum, Mexico, from December 28 to January 26, with brands such as Circoloco, Do not sit on the furniture, ANTS, Luciano, Acid Sundays, Muse, and more. ESTO ES TULUM comes to HEART IBIZA to combine the ethnicities of both cities and to combine their magic and energy in one place. Monday, October 1, Heart Ibiza. With social conscience, ecology workshops, care for the environment, care of extinct fauna. Mother Nature has given us a space of sacred ground where the mind, bodies, and souls can transcend to another level: an impressive cenote in Tulum, where more than 5000 people will be transformed to be free from worries and prejudices and will gather to Live an unforgettable experience. Heart Ibiza presents on Tuesday, October 2nd, Heart Factory closing party! Heart Factory offers a range of forward-thinking club experiences that have already seen Dj Koze, Anané y Louie Vega, Moodyman, Henrik Schwarz, Joseph Capriati, The Martinez Brothers, Pete tong, Nicole Moudaber, Cassy, David Morales, Masters at Work, Blaid:ish, Themba, Satori & Black Motion. 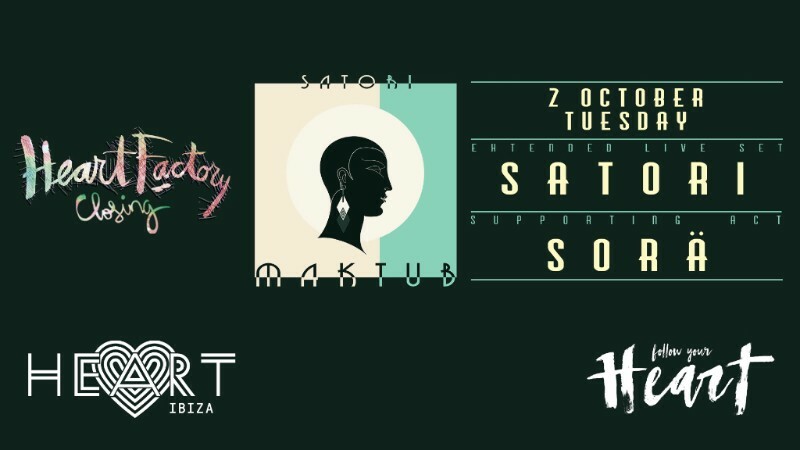 This closing, Heart Factory 2018 presents MAKTUB by Satori, with an amazing line-up: SATORI & Sora. A new series of events, one unique to the other for all your senses to indulge in. A unique atmosphere created specifically for you! I would like to make a special announcement, to let you know about something that I have been working on with my team for quite a while. We have come up with a special experience which will bring together my music with a very strong visual component. The idea is to create a more cinematic experience, where visual art will mix seamlessly with sound, producing what should be a very extraordinary atmosphere. We will be taking this throughout the next year to a select number of spaces around the world. I will also be traveling with a visual artist each time. And there will be a lot of preparation going into each event, making them unique, even compared to one another. One last chance to experience HEART FACTORY this season! Don’t miss out!